“Orchard-based ciders, that’s what I’m calling them.” That comment came from Wandering Aengus's James Kohn, and it led to one of my key recent insights about the nature of cider. It's an odd thing to say, isn't it? What else besides orchard-based would a cider be? This is one of the areas where beer and cider diverge sharply, and it's something I hope everyone puts firmly in their head--especially if the alternative is using the word "craft." Beer people may hate mass market lagers, but they can't deny that they are still beer, just like double IPAs. Made from malt and hops, mashed, lautered, boiled, and fermented--all beer is made like that. But mass market ciders are actually a different thing altogether. They're made with water and sugar, sometimes apple concentrate, get their acidity from malic acid, and their apple flavor from a back-sweetening of apple juice after fermentation (and before pasteurization), and some even use apple essence to aromatize things. They're reverse-engineered drinks made to simulate the natural flavor of apples. 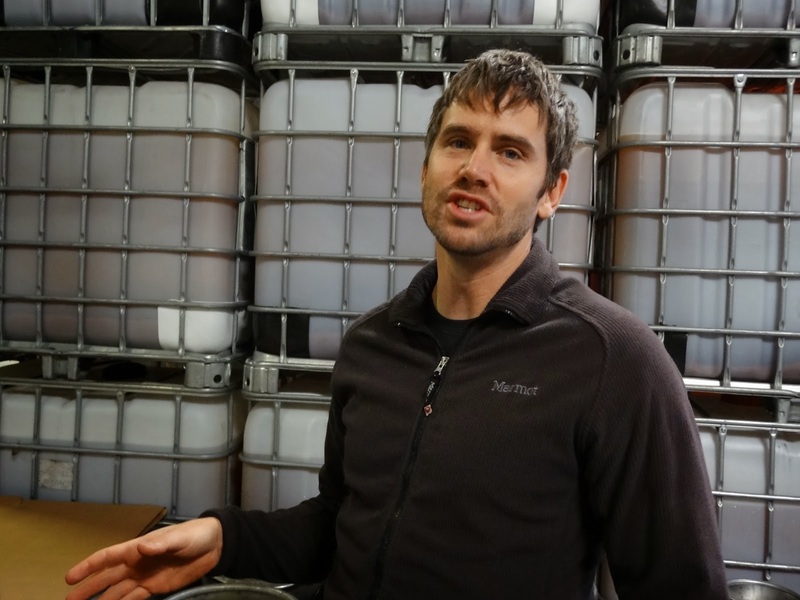 Wandering Aengus, like most of the new Northwest cideries, makes orchard-based cider. The ingredients are apples, yeast, and touch of sulfite* (a naturally-occuring compound that retards oxidation). In a Wandering Aengus, you get about three apples in liquid form, fermented. What distinguishes the products are the apple varieties and attenuation. There's still just not a ton of traditional cider fruit out there, so Wandering Aengus ciders tend toward the tart and acidic. In one interesting experiment, Gunn and Kohn have used oak-aging in one dry cider to pull tannins from something other than the fruit. Like breweries, cideries have a house character that comes from the preferences of the makers. What you get in Wandering Aengus are strong, assertive, and very dry, tart ciders. They're a really nice counterpoint to the sweet ciders made with dessert fruit that are more common. The cidery also makes sweeter, easier-drinking ciders under their Anthem banner--the line most people will have tried. These are made with Washington dessert fruit (eating apples), which leaves them without a ton of character. Sugars convert directly to alcohol, and without acids and tannins and aromatic compounds, the ciders can be one-dimensional. Like other cideries, Kohn and Gunn enliven them with other fruit--pear and tart cherry--to add interest. They also have what is now pretty common, a hopped cider. It started here: “Hop ciders are actually our progeny," Gunn said. "James’ baby." This year they took the very short drive to the hop fields and made a fresh-hop version as well. If you're wondering whether the cider thing is really a thing (there's even a game! ), consider Wandering Aengus. This year they did about 650 barrels of the Wandering Aengus line, and 5,000 of Anthem. Next year they expect to double their volume. Eleven thousand barrels? That's definitely a thing. *We can tackle the sulfite debate another time.